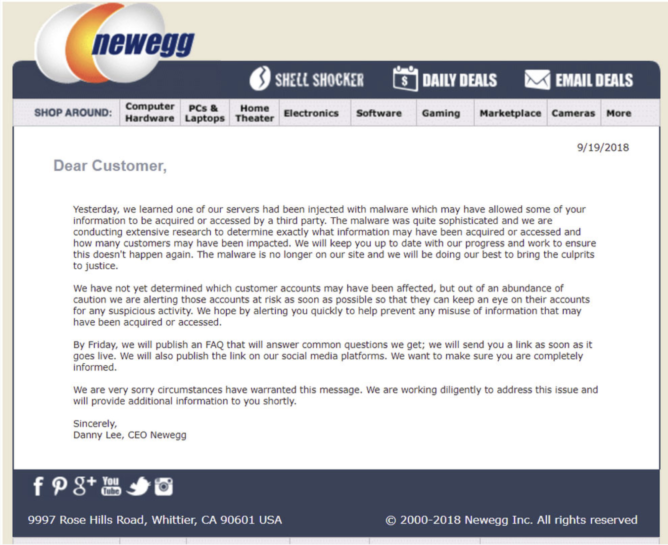 Newegg, a multibillion dollar company with 50 million customers per month, began notifying customers who made purchases during the one-month period via email Wednesday. It also plans to publish an FAQ on its website on Friday. If you've shopped recently at Newegg, you should monitor your bank account for fraudulent activity. Considering that your complete card information is now compromised, it would also be prudent to turn off your card and request a new one from your banking institution. You may not notice unusual charges right away, but it would not be uncommon for your card information to be used in the future, or sold to other malicious parties.